Some facts about The Cabin in the Woods are known by pretty much everyone who might care. Everyone knows it’s written by Joss Whedon. Most people know it’s co-written and directed by Drew Goddard. A fair few know its release has been delayed for several years due to financial issues; it was made before star Chris Hemsworth got to be Thor. (It’s been so long, you may even wonder if it was made before Bradley Whitford got The West Wing.) But the main thing people know is not to read too much about it before seeing it. And they are quite right. This is certainly a film where anything more than a minimal plot synopsis leads to major spoilers. I avoided most of these, but I did see the trailer, and with hindsight would rather I hadn’t; granted, it’s impossible to create an entirely spoiler-free trail without making the film look like a piece of generic hack work, but it still meant I was alert to some plot twists. Don’t say I didn’t warn you, even though it’s probably too late now. While it’s hard to write about the film in a wholly spoiler-free manner, I shall do my best to minimise the damage (though you may wish to stop reading now). 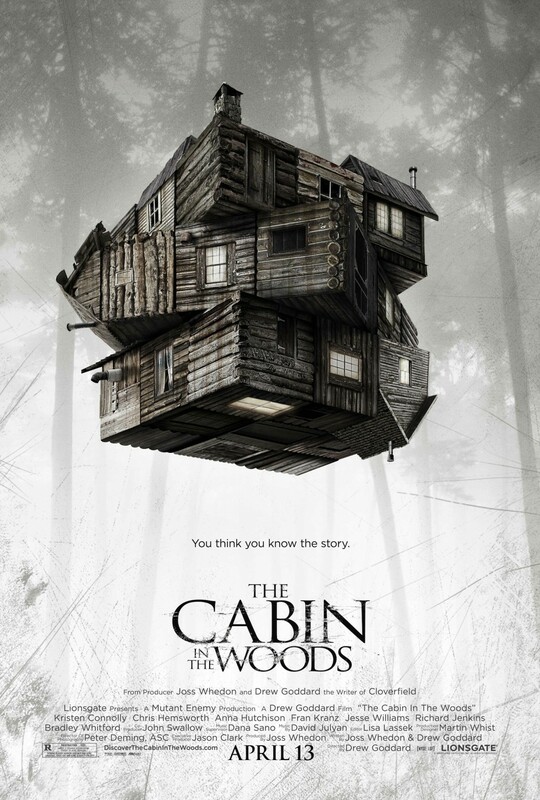 The Cabin in the Woods starts with a group of five college friends – good girl Dana (Kristen Connolly), not-so-good girl Jules (Anna Hutchison), beefcake Curt (Hemsworth), brain Holden (Jesse Williams) and stoner Marty (Fran Kranz) – heading off for a weekend in the titular holiday spot. The sort of things that always happen in these films duly happen; they encounter a creepy local at the run-down gas station, they nose around in the cellar where they find lots of weird stuff – sinister puzzle boxes, dead peoples’ diaries, old portraits of Jodelle Ferland looking scary, that kind of thing. But while that sounds like the set-up of dozens of films you’ve seen before, Whedon and Goddard delight in surprising you at every turn. One big reveal just isn’t enough for them: Cabin has stacks of them, starting in the opening minutes, with the introduction of two characters played by Bradley Whitford and Richard Jennings. Whitford and Jennings play very well together, and it’s a pleasure to watch them interact with several Whedon regulars (Amy Acker, among others). The younger cast members also make good work of deliberately archetypal characters; Kranz, who is lucky enough to deliver most of the characteristic Whedon gags, gets most of the laughs. In its deconstruction of horror film storytelling, the films Cabin most reminded me of were Wes Craven’s po-mo classics Scream and Wes Craven’s New Nightmare. One of those films was a massive hit on release, the other tanked; I wouldn’t like to guess which end of the scale Cabin will land at when it’s finally released in a couple of weeks. I don’t see it having anything like the effect of Scream, whose success led to the rebirth of the non-ironic slasher film. Certainly, I suspect not everyone will like the ending. I did, in large part because I suspected it was going to end rather differently. It’s very much a film for and by people who love horror films, but get frustrated by their clichés. It’s funny, clever, and – though the knowing humour does work against any genuine sense of dread – it’s even reasonably scary in places. It’s absolutely worth seeing. This entry was posted in Reviews and tagged Anna Hutchison, Bradley Whitford, Chris Hemsworth, Drew Goddard, Fran Kranz, horror, Jesse Williams, Jodelle Ferland, Joss Whedon, Kristen Connolly, Richard Jennings, The Cabin in the Woods, Wes Craven on March 26, 2012 by Gareth Negus.